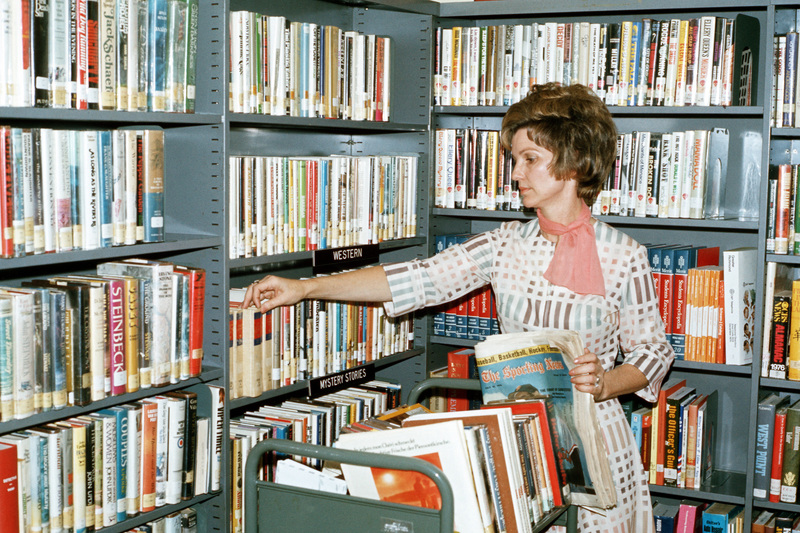 Mildred C. Crabtree, a civilian librarian, selects books in the library for distribution to the wards at Kenner Army Hospital, 07/07/1976. via NARA, ARC ID 6361889. SAA shared this via the NDIIPP, and while we can talk later about how tech magazines either refuse to employ or simply ignore their copy editors, the poor sod over at ZDNet whose spellcheck missed “by” for “buy” and couldn’t help dig him out of “Personal digital archives […] is an idea that’s about to become of ages,” is right about storage, and catches on to the idea that Amazon, Google, Microsoft and Yahoo got hip to this way before the rest of us did. But I came here to bury Caesar. First, there is a way to short-circuit the need for exabytes of cloud storage for your junk: use physical media. The shelf life of that portable hard drive the author wants you to buy is waaaaay shorter than the shelf life of magnetic tape, to say nothing of film. Transfer going the other direction, analog-to-digital, is cheaper than we’ve ever seen; can it really be long before we demand 16mm prints from our digital video? In a larger sense, isn’t it only a matter of time before we realize the scope of the tradeoff we’ve made in the wholesale transition to digital media, that we’ve traded longevity for easy distribution, and gone from owners of our content to renters of it. SO fine, that’s an old-media snob talking — albeit a reformed one; my longstanding position is that we should model our practice as consumers of media and as creators and preservers of it on the vinyl-LP-plus-digital-download. Digital delivery is unparalleled for nick-of-time, information-satisficing, on-the-go use. But to really hear things as they should be, you need to sit down with some analog — but second, is there any guarantee that the next cohort of digital users will actually be creating anything? But, Old Mole, surely you jest! Why, IBM keeps telling us that more data has been created in the last two years than ever in the history of mankind! Given the proliferation of bite-size content farms like Vine, Snapchat and Tumblr, which rely on users who want to share short, pithy bursts of well, whatever this is, and who then want most if not all of those things to go away, doesn’t the burden of storage fall on the enterprise-level provider? What are we making and keeping? Personal digital archives may already be a relic of the past. Third, and this is what gives the Old Mole hope for the future, is that today’s youth have a deep self-editing streak, at least according to this Pew Internet and American Life survey. Each content farm has a purpose — Snapchat is for sexting, Twitter is for listening to funny old people like Shaquille O’Neal or Louis C.K., Tumblr is for sharing GIFs of Korean soap operas — and that means no one place has all of your stuff. If Facebook’s business plan is to obtain a monopoly on our shared lives and then extract rent from it, they’re laughably out of touch; the youth are — blindly, ignorantly, but still — rejecting monopoly in favor of self-curation. So who says you need exabytes of storage for all the videos of every child’s birthday party you’ve ever been to? There is a cure for narcissism, and it’s shame, and teenagers have that in spades. The ultimate point is that contemporary visions of “the archive” as an infinite Borges-ian capture facility for all memories have nothing to do with archives, and I don’t even mean in a practical sense. 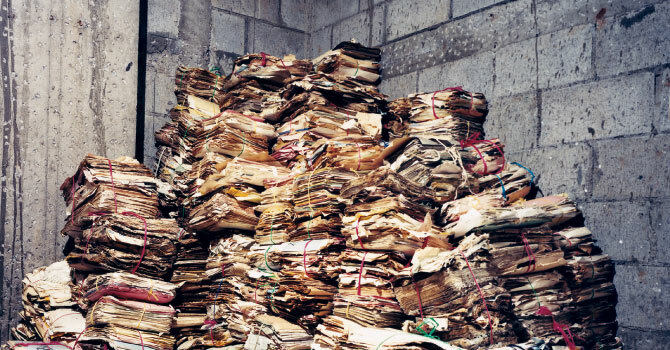 Archives, precisely because they are repositories of memory, don’t bring in everything. Memory fails. Memory is partial. Memory is latent; one of the glories of memory is that it can lie in wait for us, triggered by a glimpse of something vaguely familiar. But memory is never all-encompassing. Memory is not immersive. We have to work to understand memory. Something from the present is always lost when it becomes the past; this is what makes the past precious to us, not that there’s something irretrievable about it, but that what we do retrieve is damaged or careworn. I doubt strongly that we’re really going to cram the future with every trifle of the present, much to the chagrin of the people who want us to pay for the privilege. We’re not that narcissistic.